There are a million ways to go about homeschooling. And tons of things you can do! First, look for local support groups and co-ops and meet lots of homeschool moms. Find a good homeschool convention around you and GO. Talk to bunches of people. Figure out what really will fit you guys the best because that is going to matter most. When I began homeschooling, I was truly on my own. I knew very few people who homeschooled and had very little direct contact with it, etc. I started with My Father’s World for the perhaps dumb reason that I had other friends using it, and it wasn’t astronomically expensive. I didn’t really research it much at the time (like I now do). What grabbed me was that it was Christian-based and it was all organized for you. It is what they call “a box curriculum” where you buy a “kit” and that’s it. It had a teacher’s manual that says “do this” and “say that.” Made me feel a lot better as a beginner homeschool mom. And even though, “doing X because other people are” might have a been a dumb reason to start, we truly fell in absolute LOVE with the MFW program. If I had more kids, we would absolutely go back to it for the K-2 years IN A HEARTBEAT. I think the MFW K-2 programs are EXCELLENT. We had the best time with those years. I did add a “stronger” math (Saxon) because that made me feel better about making sure they had a strong math knowledge. I stink at math so making sure they don’t was important to me. I like My Father’s World because its approach is to keep lessons short for short attention spans, lots of hands-on activities, big emphasis on nature and spending time outdoors. My main focus to begin with was to make sure they learn to read. And math of course. Once they can read, they can truly learn whatever the heck they want. As an example, the K program last about 90 minutes a day which means there is plenty of time to be outside,and do all sorts of other activities. It was more important to spend my time and money on those “field trips” and extra-curriculars, etc. I loved that so little time was spent on “school” (what they think of as school) so they can focus on their own interests and what THEY want to learn and do. Of course, when mine got older, it came back to bite me on the behind. They didn’t want to learn what the teacher’s manual told them it’s time to learn. They wanted to do what they want to do, which means I didn’t have a teacher’s manual to follow anymore. I really miss being able to lean on that! 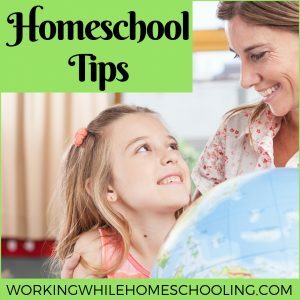 As they get older and older, they have gotten more and more independent in their homeschool work. They now do all of their homeschool work on their own while I am working, at the same time. We have mostly moved away from notebooking and unit-based approach, in favor of workbook and online curriculum (Actually not my choice, by their request. And surprisingly, they love it). We use Apologia for Science, Reading Comprehension and Writing. We use Teaching Textbooks for math. Our youngest uses Homeschool in the Woods for her history (still lapbook based), and our oldest uses Veritas Press Omnibus 1 Self-Paced Online Program, which covers Theology, History, and Literature. Eventually, our youngest will move to that as well. We are also active in a local paid CoOp-like program where they take five classes once a week that cover math, writing, art, PE, history, computers and more.